Do you know — 1 Gram of DNA Can Store 1,000,000,000 Terabyte of Data for 1000+ Years. Microsoft has purchased 10 Million strands of synthetic DNA, called Oligonucleotides a.k.a. DNA molecules, from biology startup Twist and collaborated with researchers from University of Washington to explore the idea of using synthetic DNA to store huge amount of data. 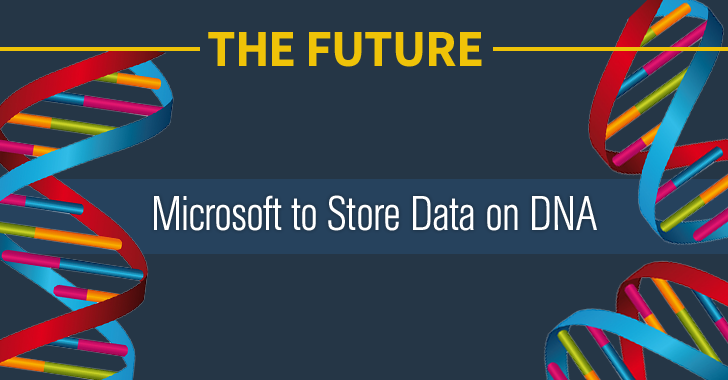 Microsoft is planning to drastically change the future of data storage technology as we know it today. The volume and rate of production of data being produced and stored every day are so fast that the servers and hard drives needing to be replaced periodically, potentially increasing the risk of corruption and data loss. According to stats, 5.4 zettabytes (4.4 trillion gigabytes) of digital data, circulating and available worldwide, had been created by 2015, and it will boost to 54 zettabytes (ZB) by 2020. How will the world suppose to store this 10 times amount of data in next four years? For this, Microsoft has partnered with scientists at the University of Washington to focus on using DNA as a data storage medium, the companies announced on Wednesday. Yes, Microsoft is planning to store data in DNA. The data storage density of DNA is enormously higher than conventional storage systems, as just 1 gram of DNA can store close to 1 Billion Terabytes of data. Besides this, DNA is also remarkably robust, which means the data stored in DNA can stay intact and readable for as long as 1,000 to 10,000 years. According to Twist, all of the digital data that exists today could be stored in less than 20 grams of DNA. Though the technology is long away from ready for commercial products (so you will not see a DNA-powered smartphone anytime soon), the initial tests done by the company last fall demonstrated 100 percent of digital data encoded on DNA could be recovered, Microsoft Research's Doug Carmean said in the press release. Recently, the American Chemical Society said in a statement that storing data on DNA could last up to 2,000 years without deterioration.